Marilyn Monroe is the epitome of classic Hollywood glamour. Many years after her death her legacy continues to live on and grow. She has been an inspirational icon to millions and will continue to touch lives for years to come. The film strip portrayed in the image above is only an example of the film cells you may receive. Please note, the cells may vary from piece to piece because they are hand selected from reels of film. This item contains clips of the film and portrays memorable images and scenes all on a stunning descriptive plaque. These elements have been double mounted and placed within a beautiful black wood frame measuring 7-inches wide x 5-inches tall. 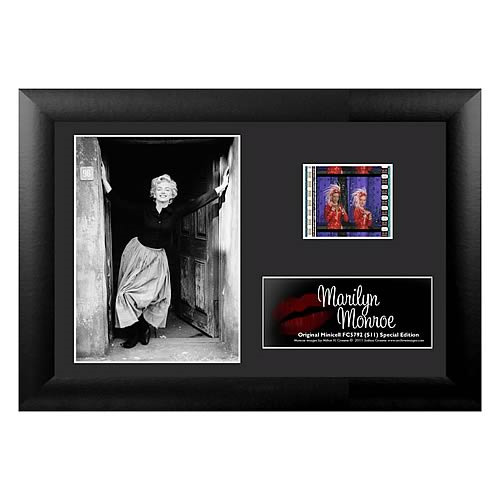 The Marilyn Monroe Series 11 Special Edition Mini Cell even comes with a certificate of authenticity.